Other Products: Quilling tool, Copic Markers (Bear and treehouse - E30, E33, E35, E37, 47, W5, Teapot and small sunflowers- Y11, Y02, YR20, YR23, YR26), Clear Crackle Paint, heat tool, paper trimmer, craft blade, mounting tape, Memento Dandelion Ink, light weight green and dark brown cardstock. 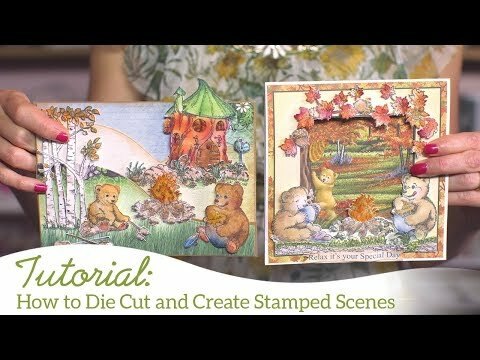 Watch this video here for tips on how to create scenes from the Beary Fun Retreat Collection. Instructions: Create a Bendi- Card by following these easy and wonderful instructions by Bihiana here. I altered the instructions by using the Fleur Border Basics Die rather than cutting the interlocking flaps freehand. Cut layers for the flaps using the Beary Fun Retreat Paper Collection. Sponge the edges with Tangelo ink. Stamp the bear and treehouse images from the Happy Time Treehouse Cling Stamp Set using Toffee Crunch ink on white cardstock. Stamp the small sunflowers and leaves from the Sunflower Accents Cling Stamp Set using Toffee Crunch ink on white cardstock. I also stamped a leaf flourish from Classic Rose Collection but this is optional. Color the bear and treehouse images with the following Copic Markers (Bear, stool and treehouse - E30, E33, E35, E37, 47, W5, Teapot and small sunflowers- Y11, Y02, YR20, YR23, YR26, teacup and dish- B000, B00, B20, B21, B24, B26). Die cut the images with the corresponding dies. Sponge the leaves with Tangelo and Bamboo Leaves. I cut 3-4 layers of the tree, stool and bear images out of dark brown cardstock and popped the layers up with mounting tape in between each layer. Keep the mounting tape narrow so it does not show from the side. I love the dimension this gives each image. Stamp the large sunflowers from the Classic Sunflower Stamp Set using Toffee Crunch ink onto white cardstock. Die cut with the corresponding die. Sponge with Dandelion and Tangelo Ink. Gently mist with water and shape with the Deluxe Flower Shaping Kit. Assemble with clear adhesive. Quill some loose coils from green 1/8" cardstock. Cut some 1/4" strips from the Beary Fun Retreat Paper Collection and quill "S" shaped spirals for the card embellishment. Adhere the treehouse, bear, stool, quilled spirals and small flowers with Dries Clear Adhesive. Glue the large flowers with a glue gun. Emma Lou has a wonderful tutorial on creating sunflowers here. Finally add Rajni's Frosting Powder to sunflowers and tree house windows as shown. Heat set.